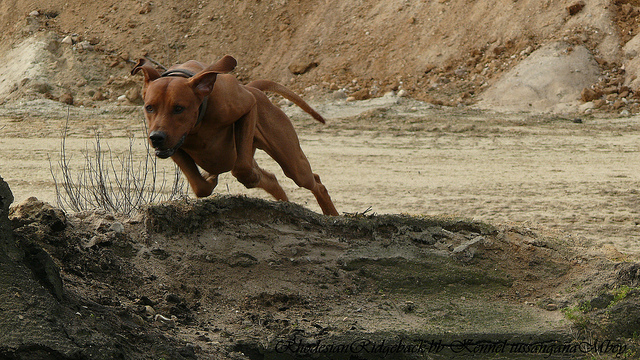 Rhodesian Ridgebacks, often known as African Bull Dogs, Ridgebacks, African Lion Hounds, Rhodesian Lion Dogs, and African Lion Dogs, are very unique and easy to recognize because of the distinct ridge of hair growing forward on the top of the breeds’ back. 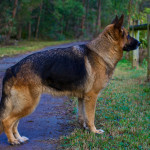 The ridge, which is a hallmark of the breed, should be symmetrical, tapering, and clearly defined, beginning behind the dog’s shoulders and going back to the hips. 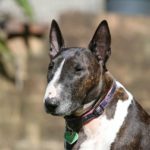 While many thought this breed was the only breed featuring the ridge, a couple lesser-known breeds also have the trait, such as the Phu Quok Dog and the Thai Ridgeback. 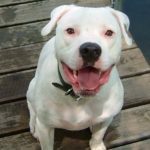 Since these dogs can be aggressive and domineering if they aren’t socialized properly, they aren’t a good dog choice for new dog owners. 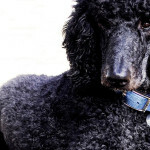 Here’s a closer look at this breed’s history, appearance, temperament, health, and more. The Rhodesian Ridgeback is a breed that goes back thousands of years and it was thought to have been developed in South Africa. The South African Bushman and Khoi people were known to have reddish brown, medium-sized dogs that had the ridge of hair that went down their back, and these dogs were used to guard livestock, herd, and hunt. Rhodesian Ridgebacks became particularly great at fighting off leopards and lions, especially when they became a threat to their owners. Jan van Riebeck, a Dutch merchant, settled down in South Africa in 1652, and he started to trade his cattle for some of the native dogs. Immigrants from France, Germany, and Holland followed, becoming farmers in the region that had an Africaan language of their own. 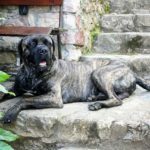 They began crossing native Khoi dogs with Great Danes, Irish Wolfhounds, Greyhounds, Pointers, Bloodhounds, and Mastiffs to come up with a breed that was better adapted to living in Africa than their European breeds were. They wanted to come up with a dog that could thrive in the extreme temperatures, deal with rough bush, brave, loyal to family, great hunter, and able to resist the local diseases in Africa. The different crosses were developed into the Vuilbaard and Steekbaard Africaan working dogs, which eventually were known as Boerhounds, which mean “farmer’s dogs.” These dogs all had the ridge of distinctive hair on their backs. Many of the farmers in the area started going north in Africa to get away from British rule, and their dogs went with them. Later Cornelius Van Rooyen, a big game hunter who was farming in Rhodesia, which is known as Zimbabwe today, started selectively breeding dogs to try to track and keep leopards and lions at bay. Ridge-backed females were crossed with his Bulldogs, Irish Terriers, Great Danes, English Pointers, Rough Collies, and Greyhounds, and these dogs were soon known as Van Rooyen Lion Dogs. 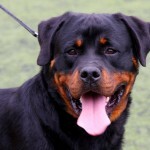 After the death of Van Rooyen, a group of people who liked the breed came up with a breed standard, which is virtually the same today. 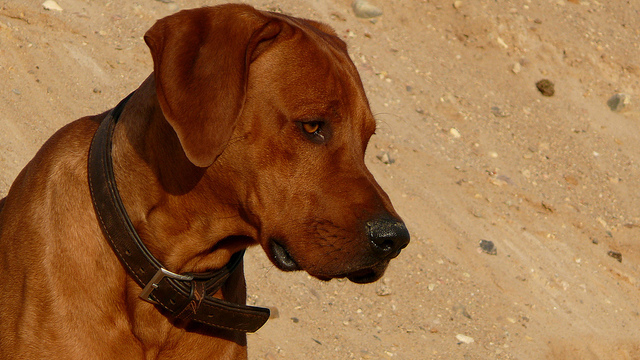 These dogs were called Rhodesian Ridgebacks, and today they are South Africa’s national dog. 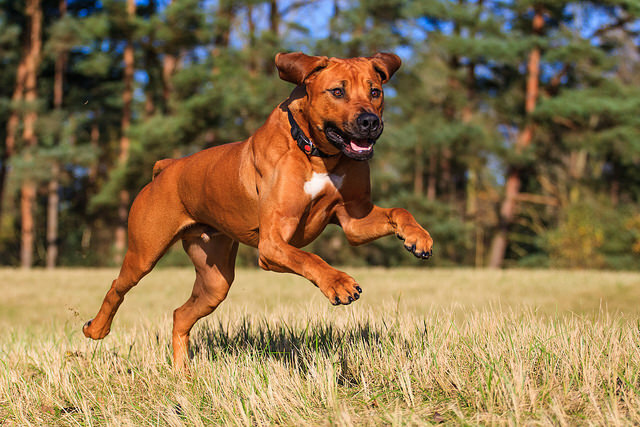 The Rhodesian Ridgeback came to the UK and the United States in the 1930s, where they quickly became popular. 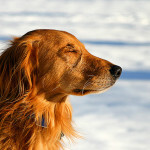 In 1955, the American Kennel Club officially recognized this breed, placing it in the Hound group. Rhodesian Ridgebacks are muscular, large hounds that have a raised, distinctive ridge of hair running down the back’s center in a strip. Whorls of hair growing in the opposite direction of the rest of the dog’s coat forms this unique ridge. 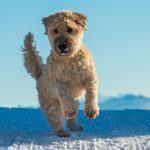 The breed can vary in color from dark wheaten to light wheaten, and some may have a bit of white on the feet or chest. It’s possible for them to be sable and brindle as well. They have a flat skull and long head with a deep, powerful, long muzzle. 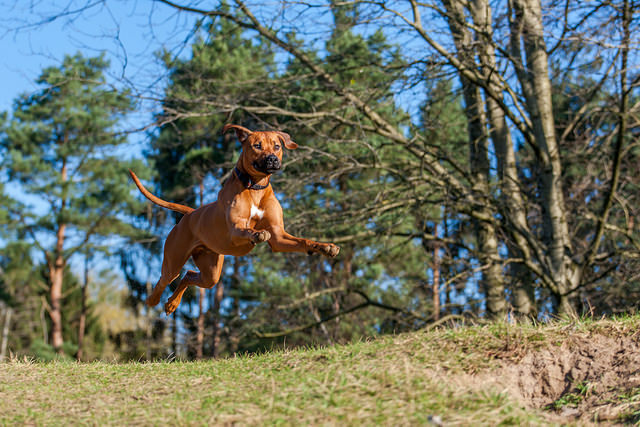 The Rhodesian Ridgeback has large, round, wide set, sparkling eyes and the color of their eyes is supposed to go with their coat color. 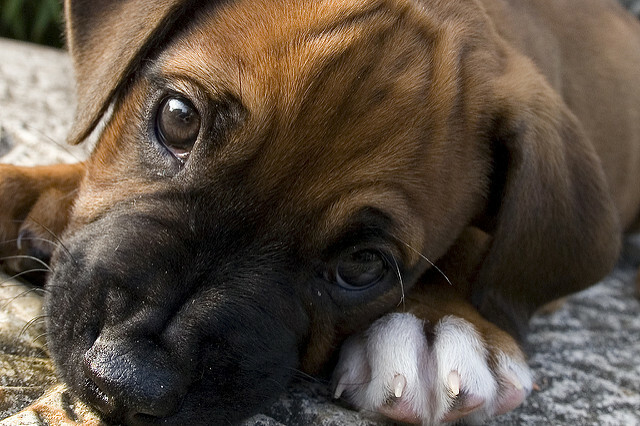 Dogs that have brown noses should boast amber eyes, while those with black noses should boast dark eyes. 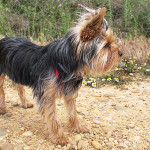 This breed has high set, medium sized ears that taper to round points, while their tail curves upward and is long, tapering from the base to the tip. 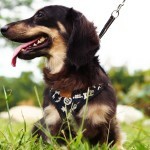 These dogs have a shiny, short coat that has little odor. 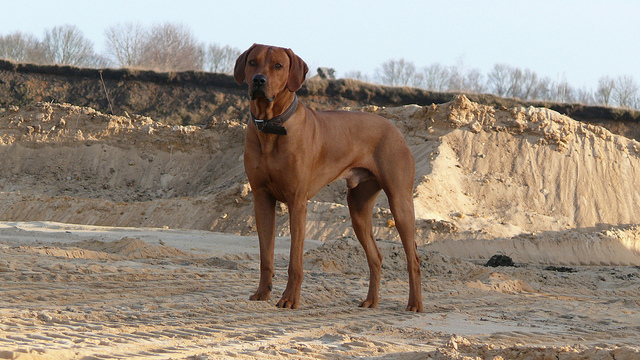 The male Rhodesian Ridgebacks should be between 25 and 27 inches at their shoulder and females should be between 24 and 26 inches at their shoulder. Males weight around 85 pounds, while females are a bit smaller and weight in around 70 pounds. These dogs should be just a bit longer than they are tall. The Rhodesian Ridgeback is athletic and dignified, with expressive eyes that make them look like they are always thinking. 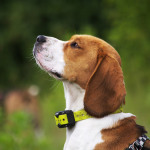 When they are puppies, they have plenty of energy, but if they are trained well and exercised properly, they can become dignified quiet family members. 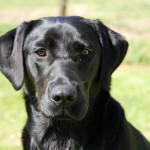 Since these dogs need a lot of exercise and they can be challenging to train, they aren’t a great breed choice for novice dog owners. Rhodesian Ridgebacks can exhibit dominance and they tend to be independent thinkers, so they need to be trained by someone with a firm hand. 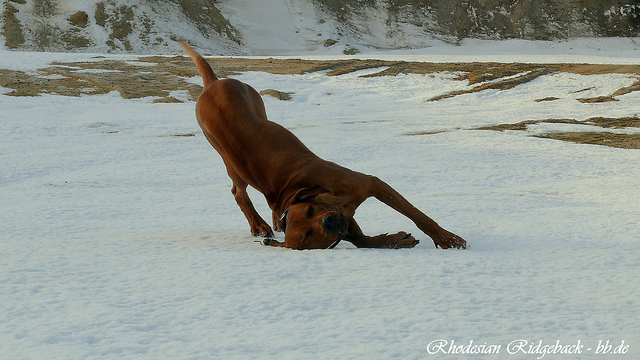 Since Rhodesian Ridgebacks have such a short coat, they don’t require a lot of grooming. They should be brushed once each week using a rubber brush, and then a damp cloth can be used to rub them down. Usually they only need a couple baths per year if they are brushed and rubbed down weekly. 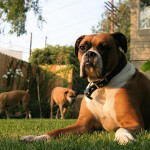 Their ears should be checked regularly for any signs of infection, wax buildup, or irritation. Cleanse ears using a cleanser that is veterinarian approved using a cotton ball. Brush their teeth weekly and trim the nails each month if they don’t naturally wear down their toenails. 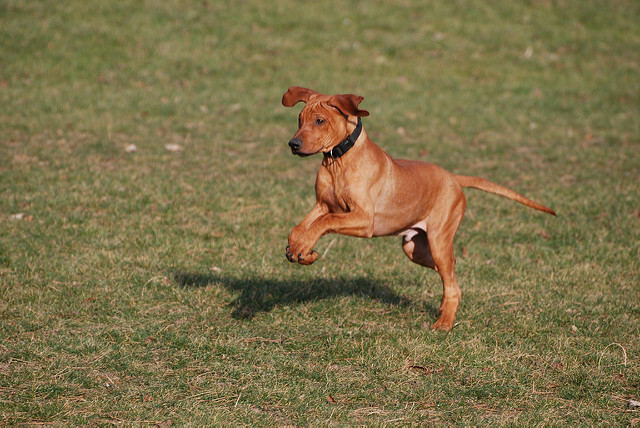 Originally, Rhodesian Ridgebacks were developed in Africa to help hunt lions. Still today, they are still used for hunting by some, helping lion hunters track, corner, and hold off the lions. However, in most cases, they are used as beloved family companions.